What a year it has been in 2018…! Around the world, there have been plenty of dramatic changes with Europe on the verge of its most significant change in 50 years as a result of Brexit, the United States becoming more divided as a result of a polarising President and currencies in Asia plummeted as China entered into a trade war. And this is all before you even consider volcanic eruptions, earthquakes and tsunamis. Indeed, 12 months ago, scientists predicted an increase in seismic activity because the Earth is rotating more slowly than before. Meanwhile, over on the Internet, it has been another eventful year with much of that impact being felt in the “real world”. Retailers, for instance, end 2018 with the same problem that they faced at the beginning of the year – increased competition from online stores. At the end of 2017, HMV went into administration for the second time in six years. Toys R Us disappeared from most countries. And the 132-year-old retail giant Sears has been closing stores after entering Chapter 11 bankruptcy in the USA. It has been a very tough year for retailers as they struggle to compete with the ever-increasing use of online shopping. However, even though people appear to love the convenience of online shopping, the myriad of Internet stores have also been facing a tough time in 2018. With the dominance of Amazon, online retailers have found it tough to attract enough custom. Indeed, conditions were so tough that the giant online retailer Tesco Direct had to throw in the towel by the middle of the year. A massive store like this could not compete with Amazon, eBay and other online stores. Another issue facing online retailers was the surge in mobile shopping. Many stores, encouraged by Google’s focus on mobile indexing in 2018, put a great deal of effort into their mobile stores, only to discover that shoppers were not that interested in them. Three-quarters of online shopping in 2018 was NOT conducted on a mobile device, in spite of the costs and efforts put in by the retailers. Most websites, like the online retailers, found it increasingly difficult in the past year to attract visitors. This was because of significant growth in competition alongside a dramatic rise in the production of “content”. Worse still, as more content was produced than ever before, fewer people were sharing that material meaning that the return on investment of content production decreased for many online businesses in 2018. If ever a content strategy was needed more than ever it is now. As businesses spent more time producing content and attempting to attract visitors, productivity faced a further decline. As the usage of the Internet increases, office productivity declines. Part of this is due to the distraction of the online world, part is due to some online procedures taking longer than traditional methods, and partly due to lack of the strategic use of online technologies coupled with a lack of training. And if you think that time management will ease the situation, we discovered in 2018 that time management techniques do not help when using the Internet. Furthermore, research revealed that all those emails you spend a couple of hours each day working on, have a significant impact outside your workplace, affecting your family too. With ever-increasing amounts of email affecting family life, it is easy to see how stressful using the Internet can become. Indeed, research published in 2018 continued to show the significant mental health effects that the mobile use of Internet technologies can have on us. in 2018 we saw more information on “mindfulness” and it seems that we discovered that mindfulness can help you cope with the online pressures. One of the reasons for our stresses in 2018 was a dramatic change in the world of social media. Facebook was embroiled in several scandals throughout the year, with privacy being a central issue bugging the network. For many companies, the business use of Facebook became rather useless in 2018 as the company changed algorithms in an attempt to deal with privacy and security. In addition, researchers found that social media has significant biases and businesses started to doubt the value of being on social networks. The pub chain Wetherspoon in the UK was one of the first major firms to cease social media activity in 2018. Even though the main online events in 2018 have painted a rather dark picture of the Internet, there have been some positive points. For a start, the introduction of GDPR meant we gained more control over what we receive in our inbox and what websites can do with our personal information. Furthermore, we discovered this year that it is easier to spot an online fibber than in the real world. Plus, we found out why some people believe “fake news” online, which shows us what we can do about it. As we head into the forthcoming year ahead all we know is that Brexit will lead to continued business uncertainty as will the erratic behaviour of the US President. 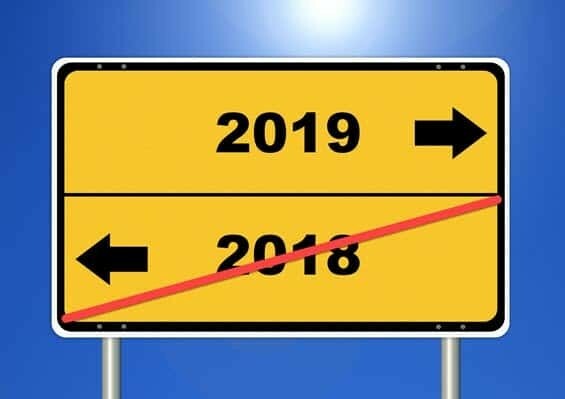 If 2019 is going to be remembered for anything in 12-months time it will be as the “year of uncertainty”. That makes conducting business tough. But it also means it is tougher online too because in parts of the world where there is less uncertainty they have the opportunity to “cash in” on the parts of the world where things are going poorly. It means that in 2019 many countries will face increased online competition as their own market wallows in unpredictability.